This week I heard a talk by Stephen Asma on “Monsterology.” Asma surveyed the history of human imaginings about monsters. Some monsters had a basis in natural history. The Cyclops, for instance, looks to be inspired by an elephant skull, since the sinus cavity where the trunk had been looks like a huge single eye. More often, monsters mark our fears—of the loathsome terrors of death, sickness, hell; of scary forces within us we cannot understand; of peoples we regard as alien out of ignorance or fear. Lately, in some films and stories, we have begun to imagine monsters as lonely outsiders, emblematic of the misfits and marginalized—inviting empathy with those who had once been disparaged (perhaps especially, in our time, sexual and gender-identity minorities). Monsters have had many meanings for us, often marking a reality we want to flee—a reality that is alive and has an agency of its own. 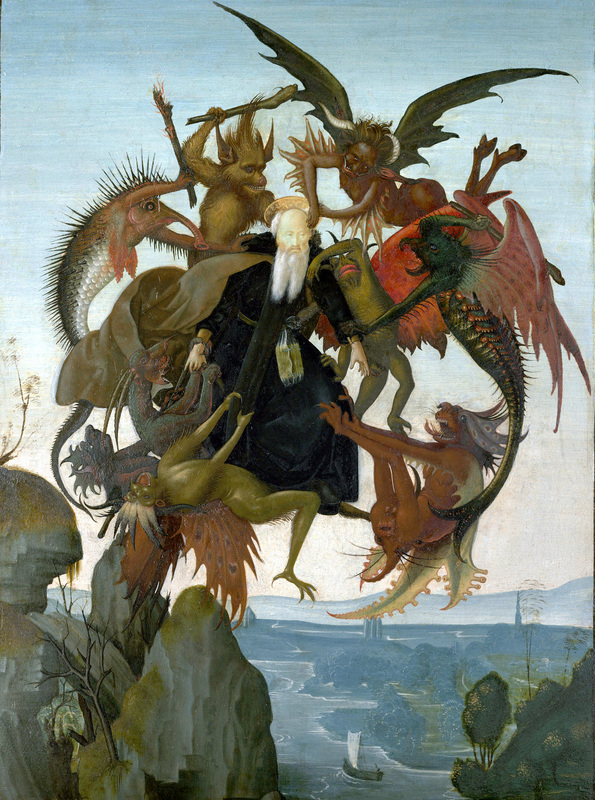 Of all the images of monsters that Asma shared with us, the one that most stood out to me was Michelangelo’s depiction of the Torment of St. Anthony. A 3rd century desert father, Anthony took disciples with whom he shared a life of prayer and work, after living in a cave for many years. Anthony was also known for battling his inner demons in the form of various monsters. And he looks serene in this sketch because he is meeting them in prayer—humbly honest about himself, yet trusting in God’s word and grace. The monsters are raucous and insistent, all around the edges of the mandala; divine power is visible only in the expression on Anthony’s face. He feels the tug of the monsters’ demands to be beheld—to define Anthony’s existence around the emotions and impulses they want to elicit from him. But Anthony looks off at an angle, seeing beyond them, with something like a Mona Lisa smile. Seeing this image immediately calms me, even brings joy—evoking a smile in response to Anthony’s own. It is so true, this image—true in a way that makes me want to laugh somehow. This is what life often feels like, especially when we are out perspective, perpetually behind in our commitments despite working steadily, wrestling with interpersonal or financial challenges, aware with a sharp jab that we’re not living up to our own or others’ expectations of us, feeling drawn by this or that desire or distracting stimulation (or feeling guilty for taking out time to watch a hockey game). Surely you can add to the list of what can turn into one of many taunting inner monsters. They arise from any troubled interface between our sense of ourselves and our sense of both God and the world’s regard of us. The monsters grow in our virtues as well as our vices—often most fierce when they pick at our sense of who we most want to be. Christian mystics and theologians have long noticed two general patterns in temptation: a temptation to presumption (thinking well of ourselves, thinking we are better than we are, caught in denial), and a temptation to despair (believing we are awful, unable to feel or trust God’s grace). If that old monk Luther is right, the temptation to despair stands closer to the door of the gospel than does presumption, when we are oblivious to our need for an anchor in Christ. If we can feel our inner monsters, we may already be better off than one caught up in a temptation to presumption. We are already on the path of humility. Our challenge then is to do as Anthony: look askance at those monsters, while being aware of them. Neither deny their presence, nor give them more of a foothold in material existence by letting them “body forth” in words and actions. But this “struggle with principalities and powers” (Ephesians 6:12) is easier with endowed power—a power present even when we cannot feel it. Baptized in Christ, renewing that baptism daily in the company of both loving our neighbor and being beset by our monsters, we can join St. Teresa in finding ourselves able to laugh at the demons. Those monsters grabbing on to Anthony suddenly look more funny than fearsome. They are part of us, but in a comedic rather than tragic way, if we acknowledge their presence (and listen for what truths they may be trying to share in a desperate upside-down way), while not giving them more weight than the reality of God’s love for us. Then we are free to love God and love our neighbors as ourselves, as free as Anthony appears to be as he travels across the landscape serenely amid his circle of monsters. Amy, I really enjoyed your blog about serenity amid our monsters. I can relate to the monster part, and I was relieved to sense that everyone else has them too, not just me. God is stronger than our demons. God can carry us. And our faith, our belief in God, and our intimate relationship with Him, may just put a “Mona Lisa” smile on our faces, from the inside out. Amy, I have to confess that I don’t visit this Blog section of the website very often, and I sense that I have missed a great deal of wonderful commentary. But…all is not lost…because I now see that I can go back and read the ones I’ve missed….wonderful! Thanks, Amy. Thanks, Chuck! And know that our site administrator hadn’t been notified of new blog comments–she is now–so I only today saw your comment. Thanks for your thoughts, and may you know whimsy as well as serenity amid the monsters.